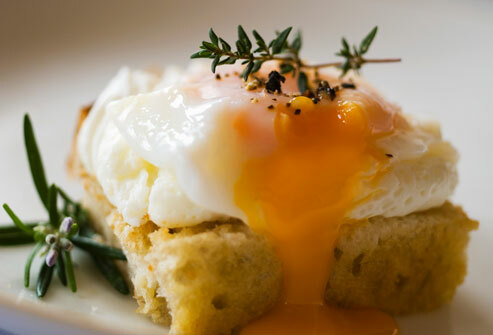 I used to try to make poached eggs the way it says in clever recipe books. It was always a fairly emotional affair, with me trying to create whirlpools and vortexes, (kept expecting Luke Sky Walker to rise out of my pan) and with a box of 12 eggs usually resulting in 8 mashed and mangled eggs, 3 scrambled eggs, one in the hair and a destroyed saucepan looking like it had a run in with the Ghostbusters. But now I make perfect poached eggs, thanks to cling film, a bit of oil and Delia’s impeccable timings. Try this at home.. and if you’re not dancing wildly in celebration of your success, I shall come round and make them for you myself. Please note that is a hollow promise. No truth in it whatsoever. (You can never be too careful). BAM! Domestic goddess you shall be and all the world shall know it. Brilliant tip, I’m off to try these! Pingback: Is it Monday yet...?